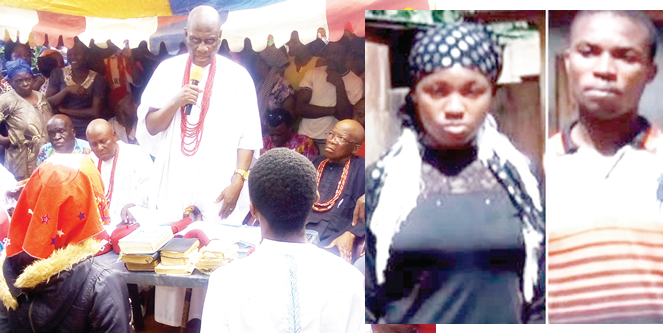 The controversial marriage between Mr Chiadukobi and Chibuzo Ezeibekwe of Agba Village Ekwulobia, which was condemned as an abomination, yesterday, went through cleansing and atonement rituals. The venue was the compound of Chief Lewis Ezeibekwe of Ifite Agba Ekwulobia. The compound and its adjoining streets were filled to capacity by people from the town and beyond. At the head of the sacrifice and cleansing was the Episcopal Vicar of Ekwulobia, Very Rev. Father Ignatius Onwuatuegwu. He was accompanied by seven young virgins, Rev. Sisters and other Catholic laities. Speaking during the cleansing, Rev. Father Onwuatuegwu remarked that the society is passing through mysterious times, showing the sign of the end time. He said that what had befallen the community and the family was not an accident but was designed by God to teach the people a lesson. While condemning the act as an abomination, he said the people had gathered not to cleanse the family, but to intercede in prayers for God’s forgiveness. Seven young virgins, a sheep and a dry palm frond were among things used for the cleansing. The virgin did the cleansing by sweeping the entire compound with palm frond after the atonement. The blood of the sheep served as a temporary blood for cleansing and holy water for purification. The blood of the lamb is a symbol as shown by God in Genesis 22:7-8 when God asked Abrahams to use his son Isaac for sacrifice but provided a lamb at the point of the sacrifice, signifying that the blood of Jesus Christ, which Christians believed is greater than the blood of the lamb or that of human being. The Rev. Father, however, asked the family to stand before the traditional ruler of the town and his cabinets, elders, and the entire Ekwulobia community to ask for forgiveness and show remorse for what they have done. Speaking one after the other Chiadikaobi and his former wife, Chibuzo, pleaded with the community and the entire people of Anambra State and beyond to forgive them. “I want to ask for forgiveness because what I did was beyond human comprehension and I have learnt that I have committed an abomination in my family and the entire community. I asked you to forgive me that I and my sister have decided to end the marriage,” he said. On her part, Chibuzo asked for forgiveness. “What I want to say is that what is happening today is beyond human understanding but I agreed to come out from where I was. I want you to forgive me,” she said. The traditional ruler, Igwe Emmanuel Onyeneke, while addressing the Ekwulobia community, regretted that he was outside the country when the abomination was committed. “I thank God that I was in the far way America when the called marriage was contracted and everybody who knew me asked what was happening in my community. “The people of this community outside Nigeria were not left out. Most of them were confused about the calamity that had befallen our town. I thank God, the church and the elders of Ekwulobia for successfully handling it to this level.